A woman at a recent Trump rally asked "Why aren't we putting our military retirees on that border or in TSA? Get rid of all these heeby jobbies they wear at TSA?" Trump didn't correct her, either by clarifying that the word was "hijabis," nor that the question mark at the end of the sentence should have been a period. Instead, he answered her by announcing that 16,500 TSA agents had endorsed him and added that this was the first time TSA agents had endorsed a presidential candidate in the entire history of the world. While Trump's answer no doubt provided fascinating dinner conversation in homes across the planet, it did nothing to alleviate the growing concern Life in the Boomer Lane that the planet is turning into a heated up (both temperature-wise and tolerance-wise) version of its former self. What is causing this? Unfortunately for LBL and zillions of boomers like her, Vox has the answer: We are. 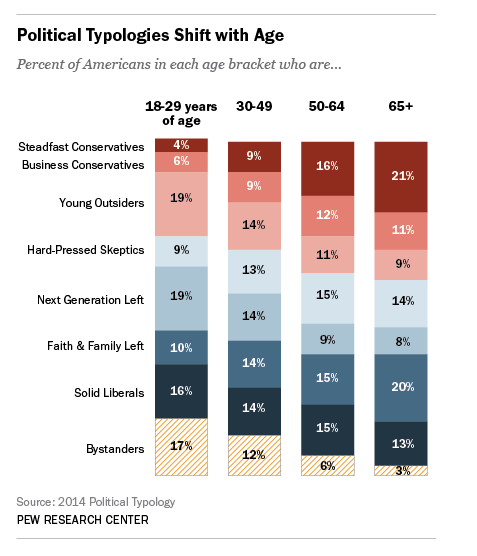 According to Vox, "social science tells us that older people tend to be more conservative than the young. Indeed, Brexit raises a big -- and disturbing -- question: Are we all destined to become more prejudiced, cantankerous shadows of our former selves one day?" In other words, is the world just one big cranky retiree who yells at little kids who ride bikes across his lawn? Various studies have shown that, while basic personality may stay pretty much the same over time (bad news for young assholes), there is a definite skew toward the right as we age. LBL, herself, has noticed that she has made the shift from spontaneous stupid decisions when she was young (Let's stand on the street in Greenwich Village and beg beds-for-the-night from random people passing by) to well-considered stupid decisions as she aged (Let's buy EuroDisney stock and watch it plummet to zero and then go out of business). Vox states that "one reason for these personality changes may be that as we age, we have an increased 'need for closure,' which is the desire to minimize uncertainty and ambiguity." Immigration, the massive, unwanted elephant in the living room of our planet, is a great example. Older people may recognize the need to extend ourselves to that part of humanity that is fleeing from life-threatening turmoil in their home countries. But, according to Vox, "We have found that older adults who try to prevent stereotypes from influencing their judgment typically find that they rely on them more and more as they age. ... Aging will tend to make many people more negatively disposed toward immigration." Huffington Post reports that two-thirds of Brits voted in favor of Brexit. And, for many Brits, Brexit was a way less to control their economy than it was to control immigration. Brexit was, in effect, a WWE match between millennial and boomers. And according to UK Telegraph, "Millennial fury over baby boomers' vote for Brexit." What can we take away from all this? Like most of LBL's posts, not much. But, on the other hand, we can become more aware that some of our decisions may be influenced more by a lifetime of stereotypes and a need for someone to "make us safe" than by a desire to do what really benefits us all. We have to be alert that we are not being influenced by the fear-mongering of certain unnamed politicians, who themselves pose a greater threat to us than the people they warn us about. In other words, we may spend so much time yelling at kids to stay off our lawn that we forget to pay attention to our own pet dog who is dropping massive poops all over the lawn.